On the second week of our Simple Machines unit, we studied wedges and levers. 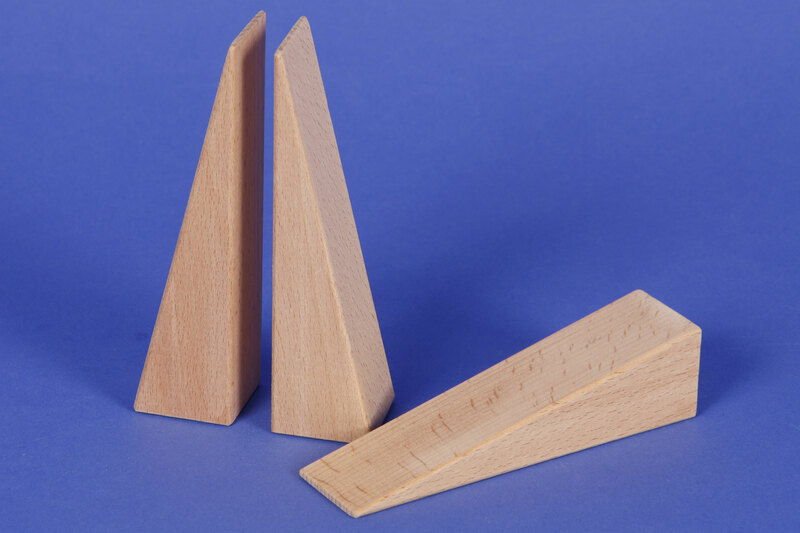 Key concept of wedges: A wedge is two inclined planes, brought together in a sharp edge. 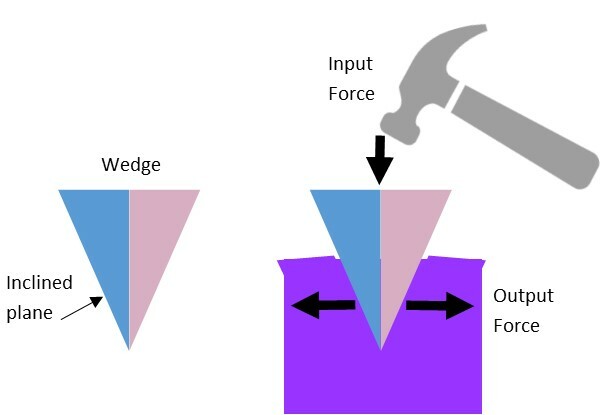 You place that sharp edge on an object you want to cut or separate, then you add force to the flat side (input force, shown with the hammer above). 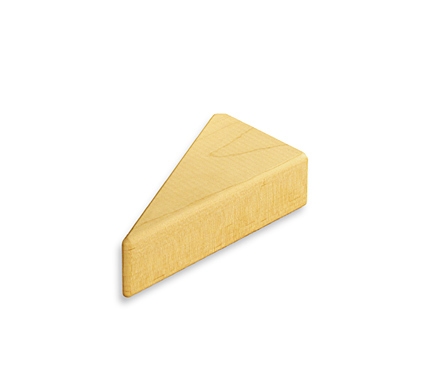 The wedge pushes into the object, with the force pushing outward to separate it (output force). Explaining the key concept: Take one triangular block. Show how the hypotenuse forms an inclined plane. Then put two blocks together, showing how two inclined planes form a wedge. Turn that upside down – see how the sharp point is like the sharp edge we used to cut the play-dough? We can use that point to separate things. Balance two books so their spines face up (or put two rectangle blocks on their sides next to each other). Push the wedge between them and it pushes them apart. Book and Song: Choose from those listed in the Simple Machines post. We read, and sang: Move It! Work It! : A Song About Simple Machines. Optional additional concept: Doorstops, shims and wheel chocks are all wedges. They’re like ramps you shove underneath an object (or between two objects) to make it harder to move. It’s a little tricky to explain to kids how this counts as a wedge, but they can definitely see what makes each of these tools a useful tool to know how to use. Nails: Nails are wedges. They are usually pushed through one object and into another to hold the two objects together. If you have kids over 4 or 5, they can use real nails, and a real hammer (better if it’s not a claw hammer…) with training and supervision. 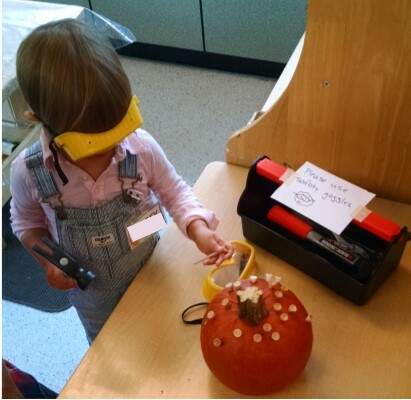 In our classroom, we used golf tees and toy hammers (I love these ones from Black and Decker – we also use them when we build houses from foam insulation panels). We pounded them into thick pieces of Styrofoam and into a pumpkin. Note: safety goggles are a good idea! If the tees went all the way through the Styrofoam and were pressed against the table, and then kids hammered hard on them, the top of the golf tee can break and fly up. Scissors: Scissors are both wedges (the edge of the blades) and a compound lever, so this is a good week to have a scissor practice activity. For example, put out papers with zig-zag and curved lines and have them practice cutting. Axes: Another common use of wedges is splitting wood. 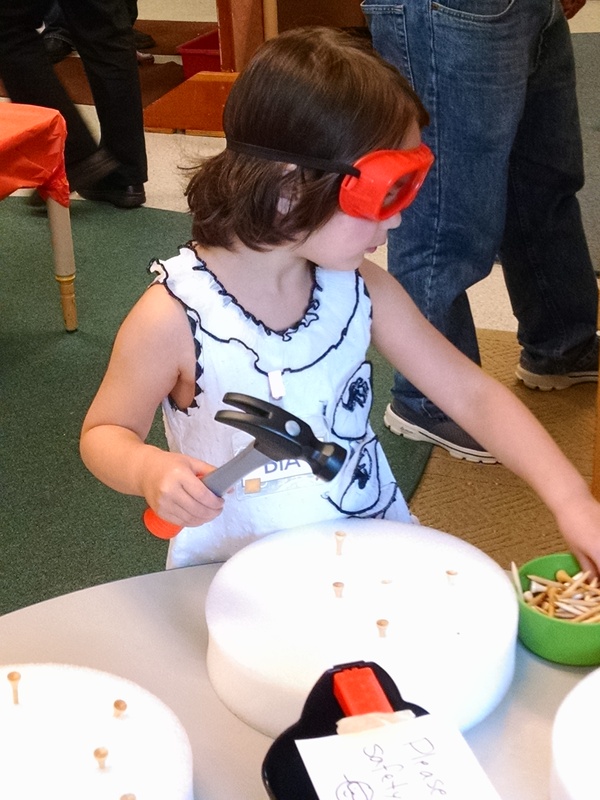 I have not figured out how to simulate wood chopping in any safe way in a classroom of pre-school age kids. There used to be a toy that did this but I can’t find any. Tell me if you have ideas! Sensory table: Fill with rice or sand or whatever. Put in some square blocks and some triangles (wedges). Which are the easiest things to push through the sand? You could also include toy snowplows or bulldozers. 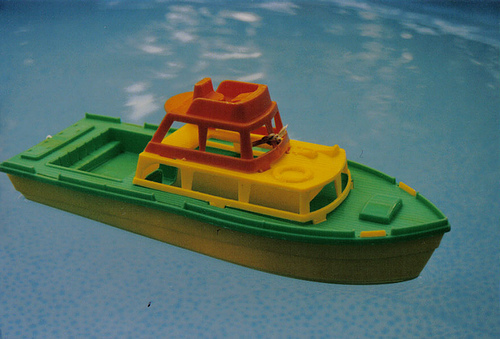 Water table: Put in toy boats (you can make some from milk cartons if desired – just search on Pinterest for PLENTY of directions on how to do this). Show how the bow (front) is a wedge, which helps it move through the water. Have them try pushing it through the water backwards (stern first). It doesn’t move as well. Make your own fruit salad. The littlest kids can slice bananas or seedless watermelon with plastic table knives. Middle-size kids could use scissors to snip marshmallows (or maybe grapes) into smaller pieces. Older kids could cut apples, or oranges with a sharper knife. You could also use a melon baller or chisel on the melon. Snack time lesson: Have kids bite into an apple slice with their front teeth (wedges). They cut through the slice easily. Then have them chew with back molars (not wedges). These grind the food.